The Entry Level Receptionist Resume Template provides direction for job seekers seeking to embark upon (or wishing to gain more experience in) the field of office reception. 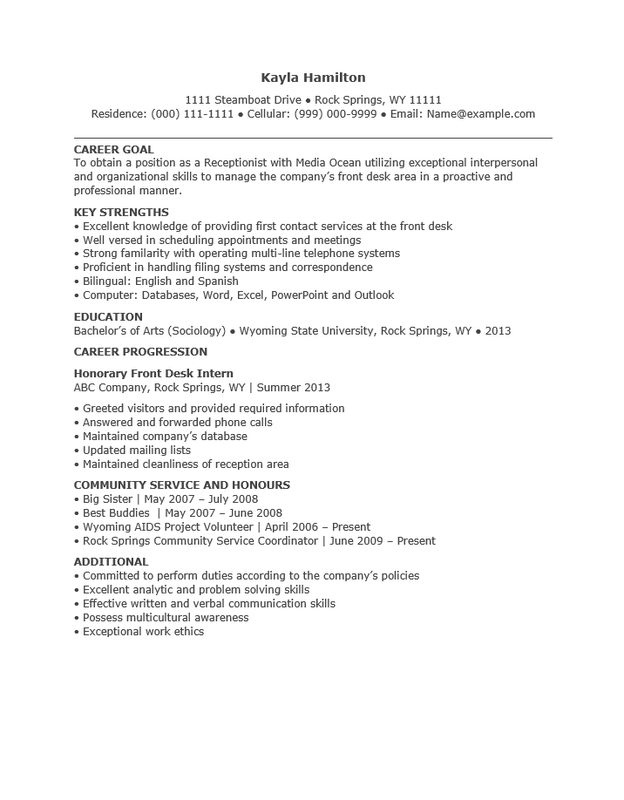 The benefit of utilizing a resume template is quite clear when composing one for the first time. It may act as a road map for how to organize your skills and experience into an attractive and coherent document. The content must be filled out by the user however there are defined sections contained in a template which the user may follow. There is an additional benefit to the use of a template. Once it is filled out a job seeker will have a base resume or a master document. This may be quite general however, it is a good idea to gear a resume to one particular employer. In order to solve this problem all one has to do is copy and paste the basic information from the master document (i.e. 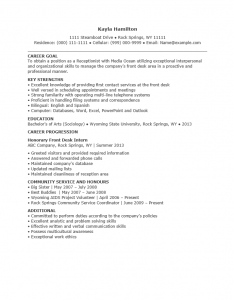 contact information, education, experience) into a blank template. The format is already there in the template and this allows a user to focus on content that is specific to a potential employer (i.e. Career Goal). A personalized resume that is smartly written and looks attractive will tend to attract positive attention from a hiring entity. Step 1. One of the most vital pieces of information on this resume will be your name and contact information. These should go at the top of the page. It is usually a good idea to add an effect to your name to make it more noticeable. Step 2. The “Career Goal” section should be a statement or two about your intention to gain the position and why. As mentioned in the introduction, this is an ideal place to personalize your resume for a potential employer by including their name. Step 3. The “Key Strengths” section is a great place to make up for any lack of experience. Reread the job ad and apply your proficiencies to the requirements stated within it. Step 4. The “Education” section is reserved for your academic credentials. Include the title of your degree, where you attained it, and the year of graduation. It’s also a good idea to include any honors or awards you may have received there. Step 5. If you have not worked professionally before, enter any experience where you were responsible for something that may require payment. This is the “Career Progression” section. If you have worked professionally, change the name of this section to “Experience.” In either case, state the official title you held, the company/person you did work for, their location, and the dates. If possible include a list of what you did. Step 6. In the “Community Service and Honours” section list any notoriety or volunteer work you did. Include the title you held, where you held that title, and the year. Step 7. The “Additional” section is where you will place any information that would support your inquiry but is not appropriate to include anywhere else on this document (i.e. fluency in another language).